Abandon all faith, ye who read this post. The Mitsubishi Eclipse name is, in fact, returning—as a crossover called the Eclipse Cross, per Automotive News. It’s an Eclipse I wish was a mirage, but not a Mirage, because for the love of all things holy, don’t do this to the Mirage nameplate, too. Did no one tip them off that the people who still remember the Eclipse coupe fondly don’t care about the crossover boom? Just call it a mishmash of letters and numbers like the other bland lumps and leave the good Eclipse name alone. 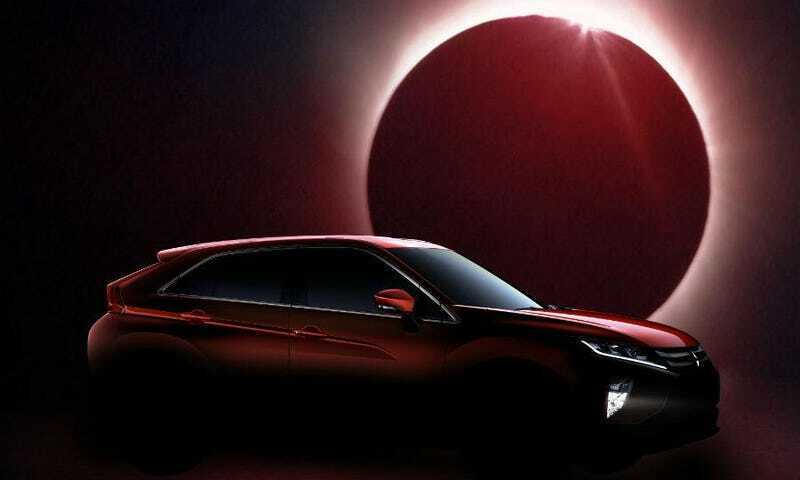 “The Eclipse Cross’s beautiful, dynamic form serves to bring about the same sense of excitement and inspiration as the diamond ring seen immediately before and after a total solar eclipse does,” the Japanese carmaker said. The new vehicle’s high-saturation red body color, Mitsubishi added, will evoke the brilliance of the sun’s halo flaring from behind the moon. I guess they sort of nailed it. The idea of calling a crossover the “Eclipse Cross” does sort of remind me of when demons blocked out the sun and over-ran Sunnydale on Buffy the Vampire Slayer. Nothing matters anymore. Might as well open the Hellmouth. Additionally, the Outlander Sport is expected to shrink to further differentiate it from the Outlander, Automotive News reports. The Eclipse Cross is expected to fit somewhere in between those two in size. Please excuse me while I weep softly in the corner until it all goes back to normal (pun intended! ), and Mitsubishi makes cars that are fun to drive again.